You just knew they had to screw it up... Well, not really. But sometimes they print albums one way then they print them another way. There are really not that many that I am aware of but I'll show you what I know. 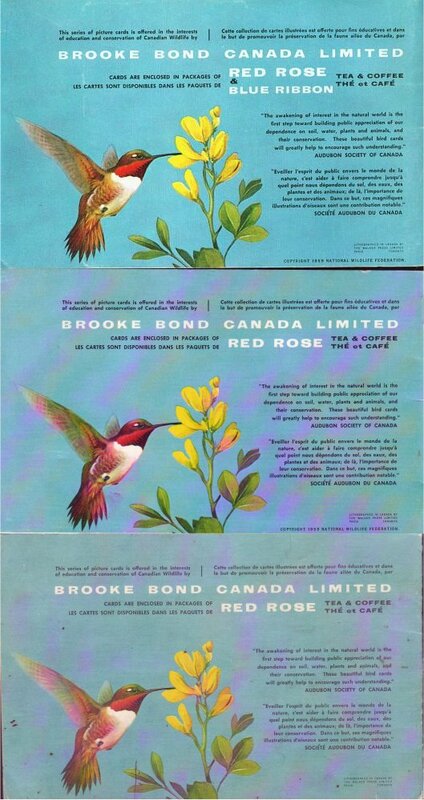 The first, Songbirds of North America is a variation on the back cover. The variation is whether it says just "Red Rose" or "Red Rose & Blue Ribbon". Which is the harder to find? The one that just says "Red Rose." Now there is an update to this story of Songbirds. We can thank Terry Gomes for keeping the hobby alive with more differences to watch for. We know that the Red Rose & Blue Ribbon album is more common than the one that just says Red Rose, but Terry discovered that there are two versions of the Red Rose albums. 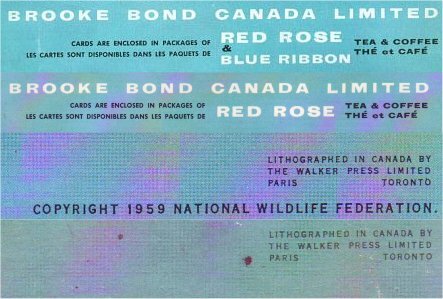 One version has nothing below the Lithographed in Canada blurb and another variation has COPYRIGHT 1959 NATIONAL WILDLIFE FEDERATION. below the blurb. Here are just the differences up close. First it's Red Rose & Blue Ribbon vs. Red Rose. Next it is COPYRIGHT 1959 ... and not. Thanks again to Terry Gomes for discovering and sharing the image with us. You want to see all three backs in their completeness... I don't blame you, me too! Let's get out there and find some new albums!!! In series 11, Trees of North America, the color of the center pages can be different. Pick a page, any page towards the middle, I like page 13. As shown here, it can come in green or it can come in yellow. Which is harder to find? That's a tough one, both are relatively easy for me to find. Does anyone else have a different opinion? This is not really a true variation, it is really a matter of reissue. In 1972, the original Animals and Their Young was issued. Then 18 years later, the cards and album were reissued. The biggest difference is the price, from .25¢ to $1.00.